This Flat Ring Eggbutt Snaffle Bit with Copper Roller is made to last for many years to come and rest assured you are buying superior quality horse bits here at our Horse Tack Store. 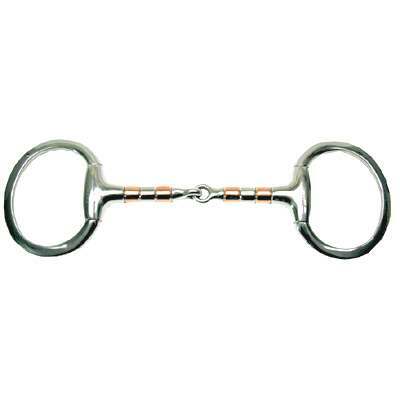 Our Equine Snaffle Bit is made of amazing craftsmanship made using only High Grade Copper which keeps the mouth soft making the horse salivate, Roller relaxes horse's mouth. The flat ring eggbutt bit is also composed of solid stainless steel. The eggbutt style also makes the bit stationary and prevents pinching of the lips. The size of this item is 3'' in the rings and 15mm mouth. You can see the high quality craftsmanship in the image above. It was made with precise details to offer excellent comfort for your horse.